Flavours of Lennox Award Night wrap up! So it’s all done and dusted for 2016, but despite the success of the Love Lennox Festival and the following Flavours of Lennox Award Night, the organises haven’t had time to slow down. We are busy planning, plotting and scheming to bring you the best festival to date in 2017. So watch this space, and don’t forget to sign up for our newsletter to keep in touch! And now the run down on our winners! 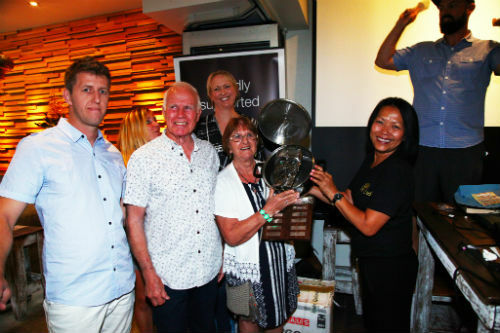 2016 Flavours of Lennox Winner – Pancho Villa is now the proud holder of the Flavours Trophy, as well as recipient of a fabulous accommodation prize from Ramada Ballina. Groovers, Family curry hub Indian restaurant, Fishy Fishy, Let’s Celebrate Health. Amazing food. Well done to the runners up! IGA Lennox Head & The Point Cafe for their amazing efforts on the day. Both these venues took their food out into the street and among the festival to make sure everyone had a chance to try their offerings. Well done! The 2016 Connoisseur’s Award went to Let’s Celebrate Health for their amazing Lennox Lime Cheesecake, which can currently be bought at IGA Lennox Head. All public winners are being contacted. Plus we had plenty door prizes, free food and great company for the night. A special thanks to Lek from Lex Thai for hosting the event and so graciously giving up her reign. At the end of the night the amazing turn out, atmosphere and contributions & dedication to the event made everyone feel like a winner. And that’s what it’s all about! We are looking forward to the 2017 Flavours of Lennox, and we’re sure they event will bring with it fierce competition, delicious food and spectacular benefits for Lennox Head and all its businesses, residents and visitors. Meanwhile check out our Facebook photo album from the night, and don’t forget to tag yourself!